Taking the day off yesterday left me with my mind sharp and my body rested, so as I was getting ready to leave Pueblo I started thinking about trying to make this another big day. Over breakfast I decided to try to make it to the vicinity of Guffey this afternoon, which was a distance I had budgeted two days of riding to make. As I left Pueblo the terrain began to remind me more and more of the west. 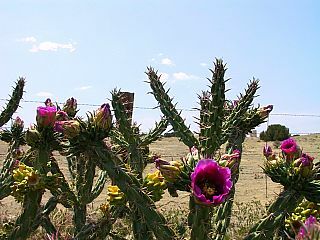 The flatness of eastern Colorado faded away altogether and I found myself among canyon walls and flowering cactuses. 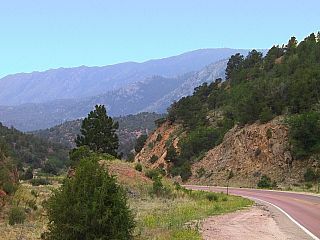 The foothills of the Rockies had me climbing and descending over and over with practically no net elevation gain, and around 3:30 in the afternoon I found myself in Cañon City where I had a mail drop to pick up. After tending to my mail and having a quick lunch I rode to the vicinity of Royal Gorge, where I had to make my final decision for the day. Either stay in a campground here, or push on and try to make Guffey by sunset. With roughly 3,300 feet of climbing left and only four hours of daylight left, pushing on would be cutting it close. But something inside me didn't even want to consider stopping, so without much of a pause I turned onto Colorado Highway 9 and started heading uphill. None of the Colorado wildfires were burning in the immediate vicinity of my route, but a wind from the north brought the haze and smell of smoke down to me. At some point after passing 7,000 feet I noticed that my lungs were working harder than usual to make use of the thin air I was passing into. Just as the waning hours of dusk were upon me I made it to Warren Schechter's hostel, where ten dollars got me a cabin for the night. Physically, today might have been one of my most demanding yet. While 92 miles doesn't come near my record for this trip, it took around 6,300 feet of climbing and 2,500 feet of descending to reach my final elevation of 8,700 feet. Most of this work had been done in temperatures hovering around 105 degrees, and my fluid consumption for the day had been nearly four gallons.